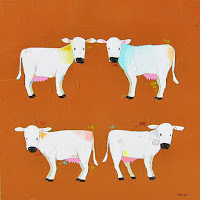 Divine Bovines are Udderly Wonderful at Wilde Meyer! 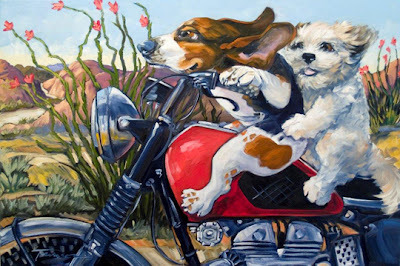 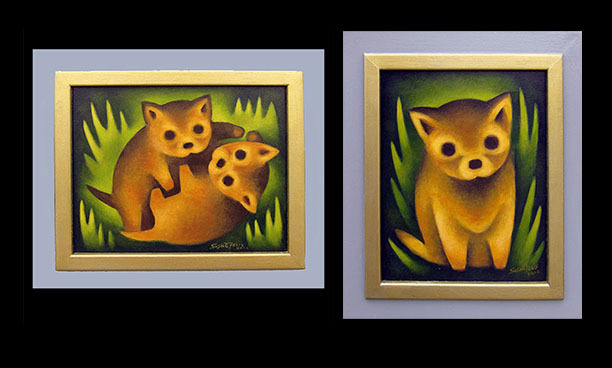 Wilde Meyer artists tend to like animals. 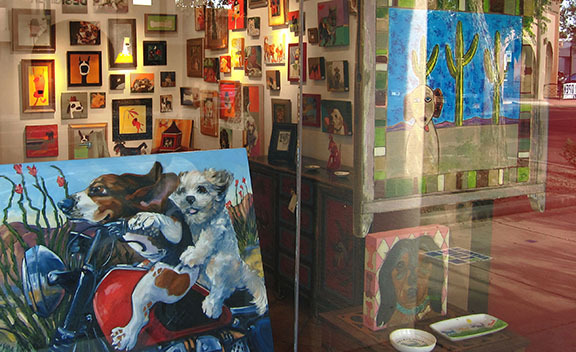 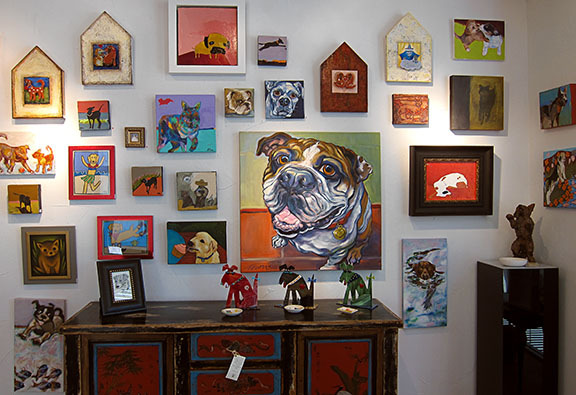 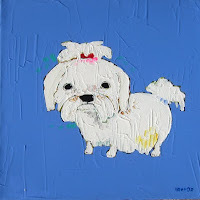 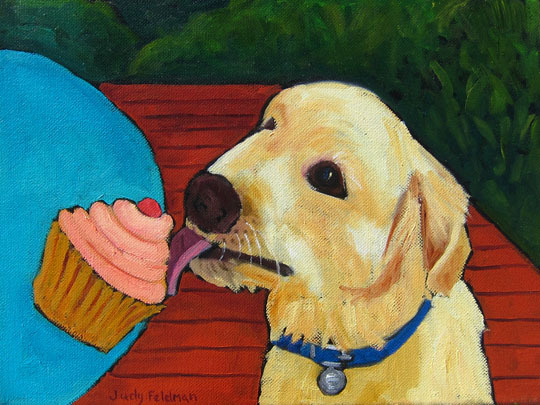 It’s not at all unusual to see images of dogs, horses and even chimpanzees when you walk into any of their galleries. 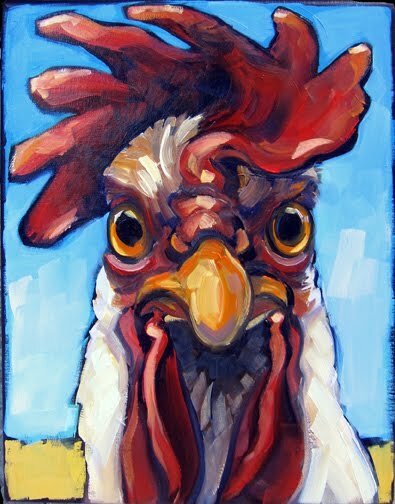 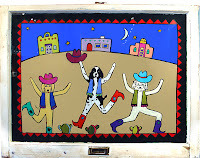 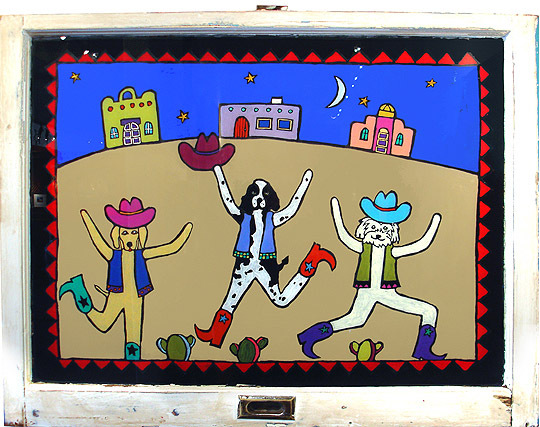 But, this month, some other animals will be prominently displayed in Scottsdale at the first “Divine Bovine” show. Here, you’ll see all sorts of bovine art: cows, buffalo, bison and yaks. 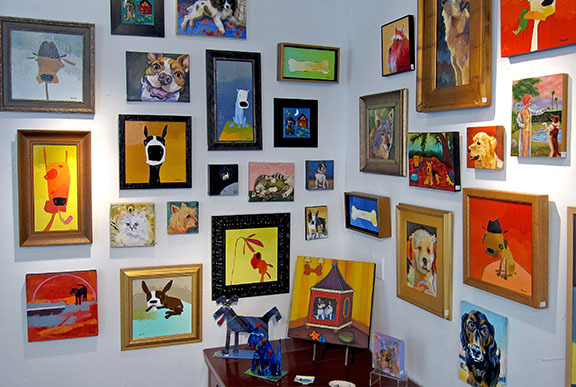 At least 25 artists are participating in this themed show. 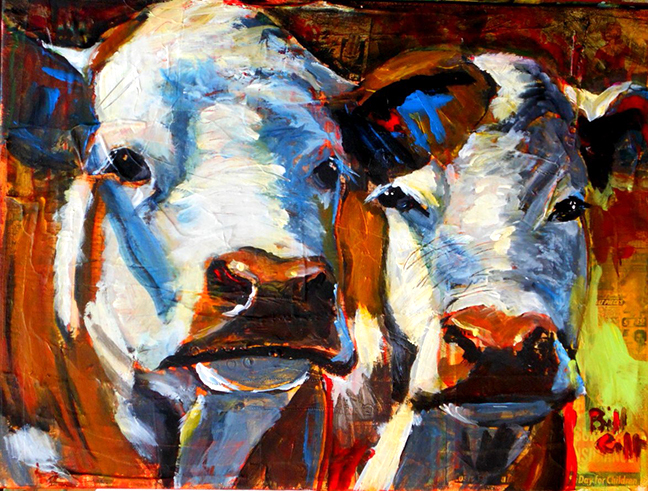 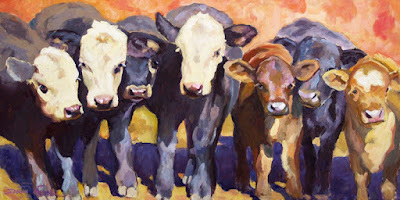 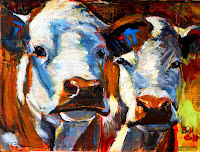 Some of the artists, like Bill Colt and Sarah Webber, have favored painting bovines for quite a while. For some, like me, it’s a first time we’ve painted a bovine. 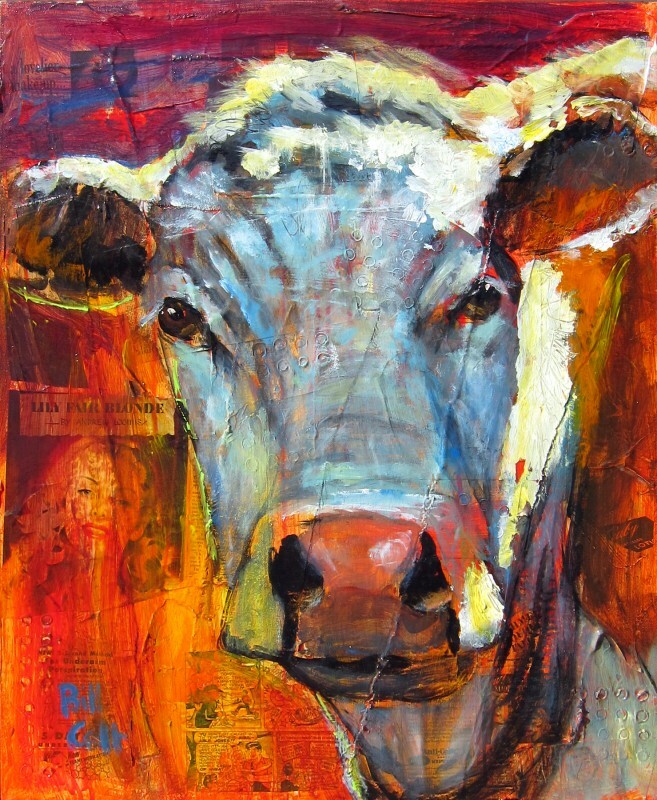 I don’t know why I never thought of it before, because I do think cows are beautiful, especially their expressive, heavily lashed eyes. 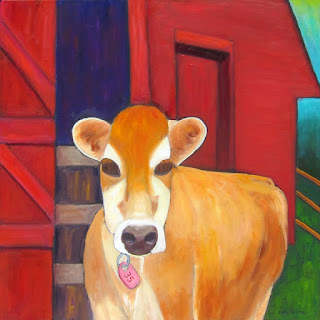 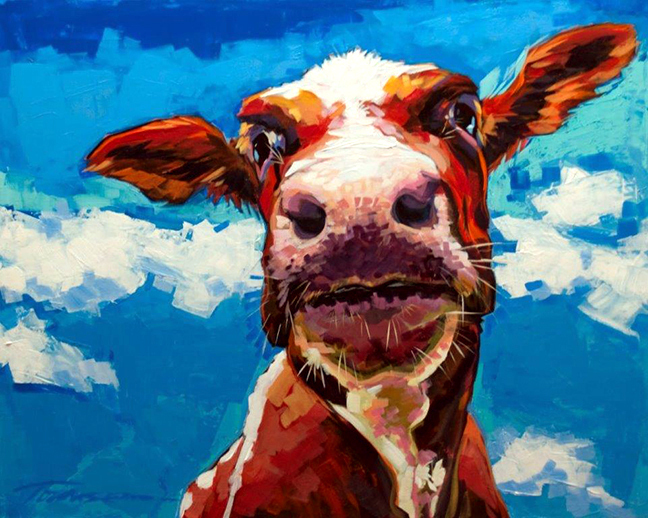 I thoroughly enjoyed painting “How Now Brown Cow,” and I really did feel a bond with this lovely creature! 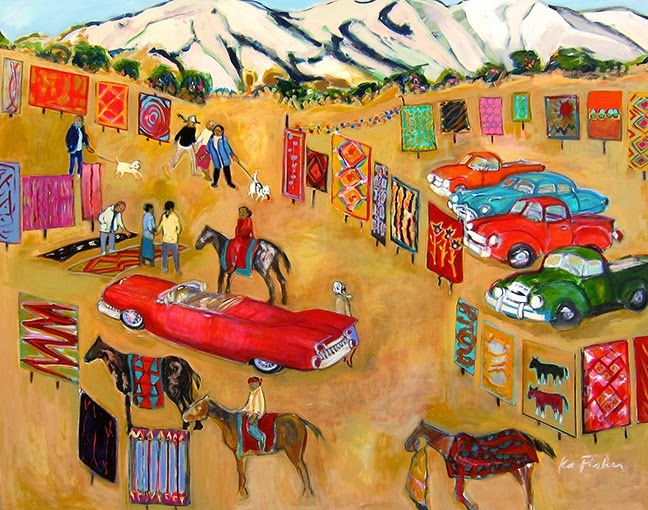 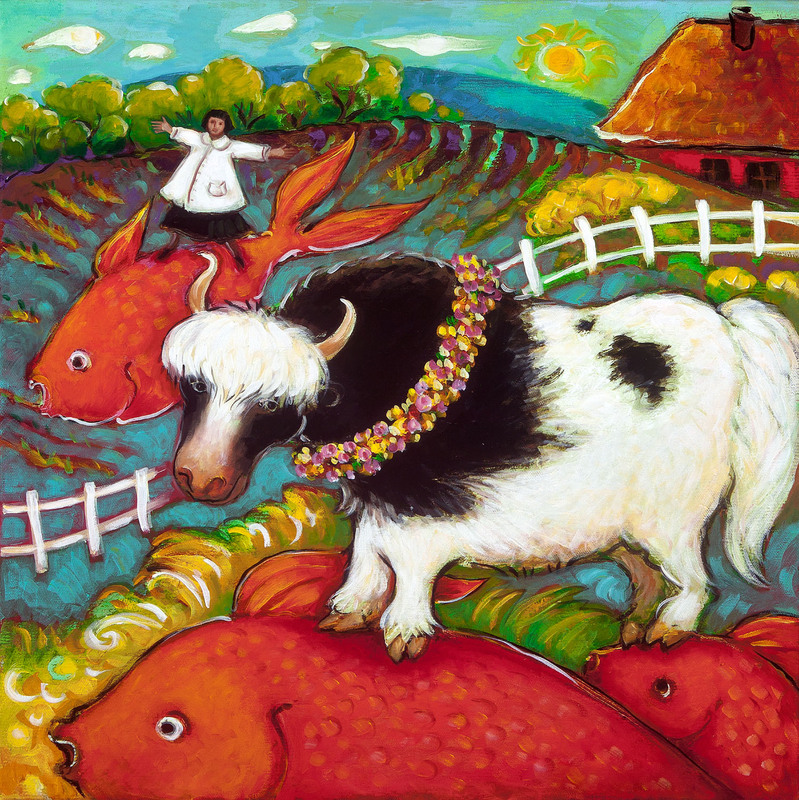 Linda Carter Holman has a personal relationship with the subject of her painting, entitled “Small in a Fuzi Dream.” The yak belongs to her! 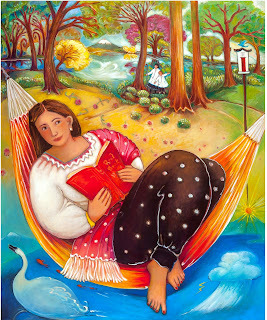 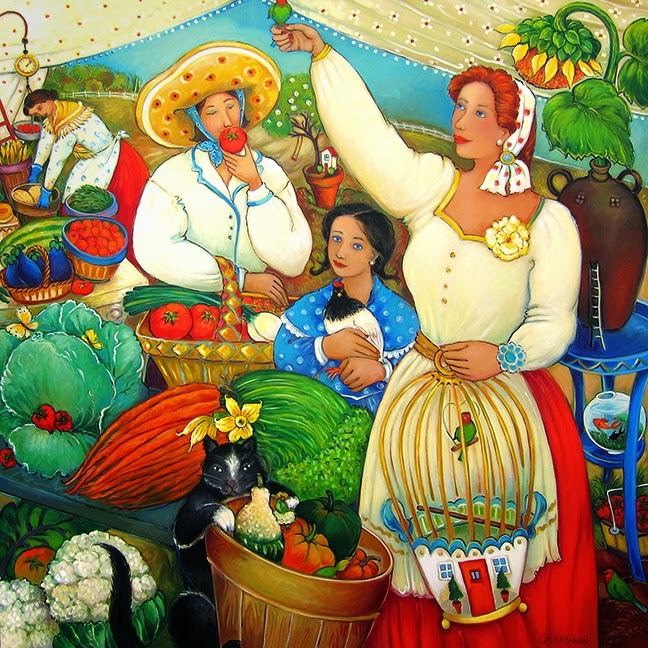 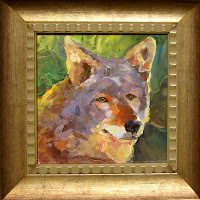 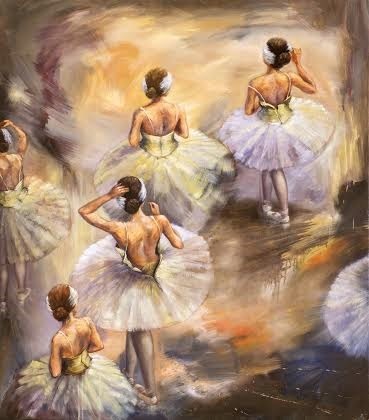 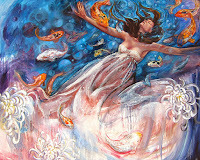 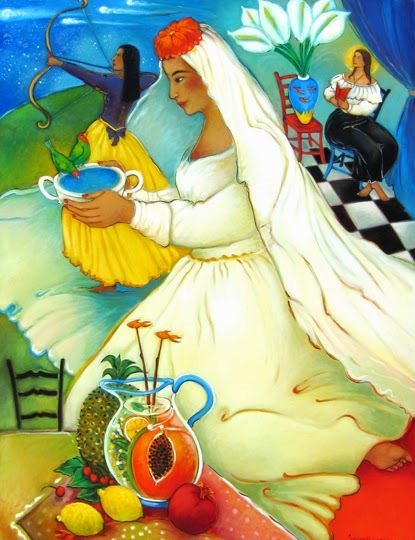 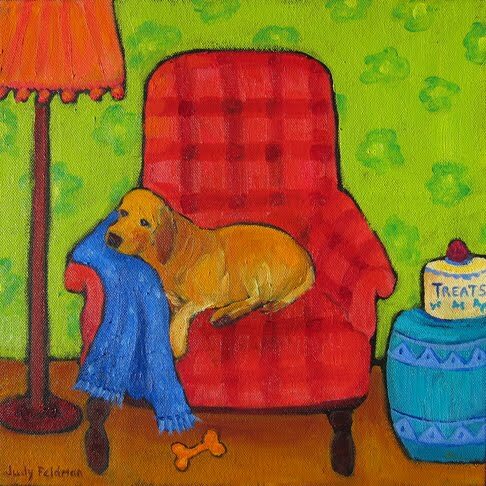 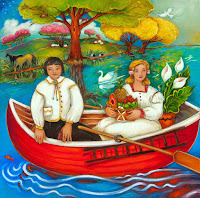 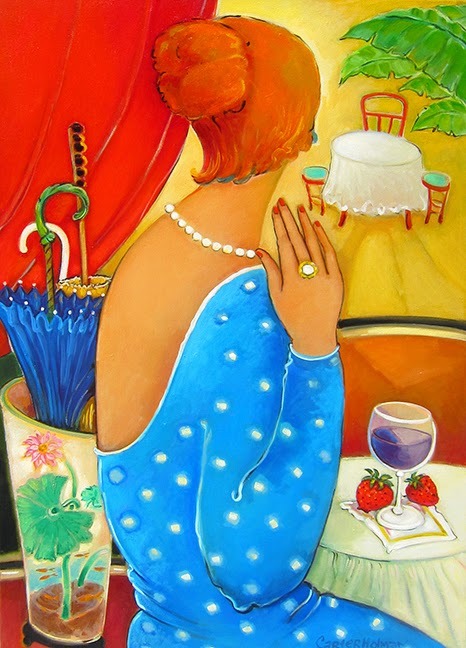 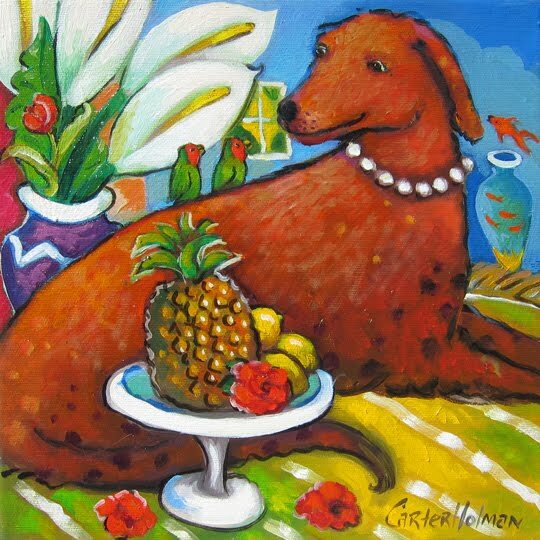 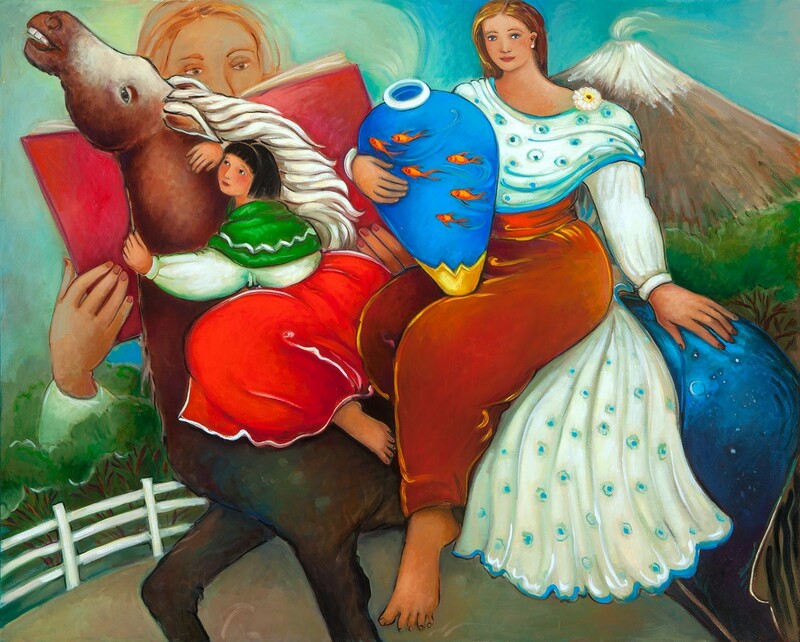 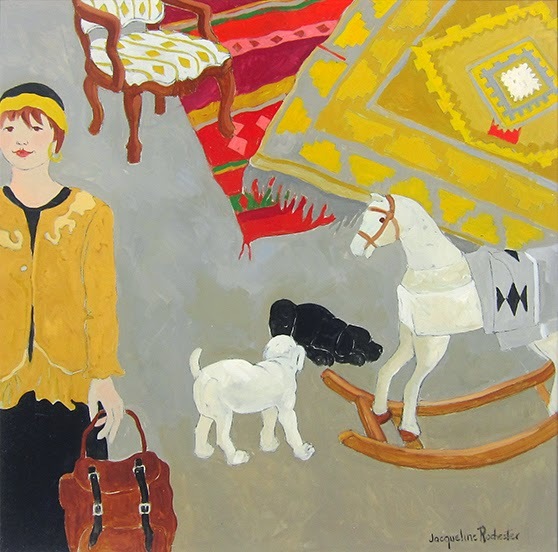 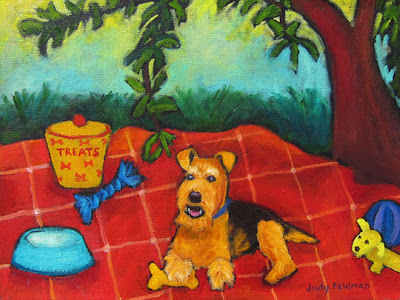 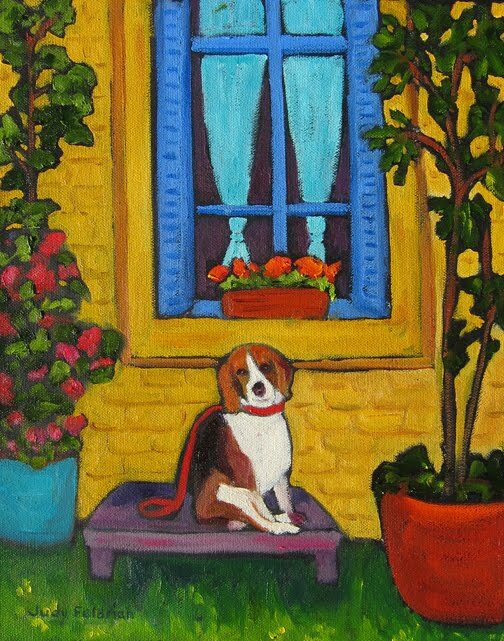 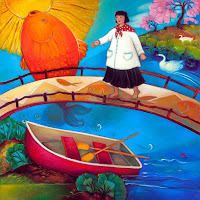 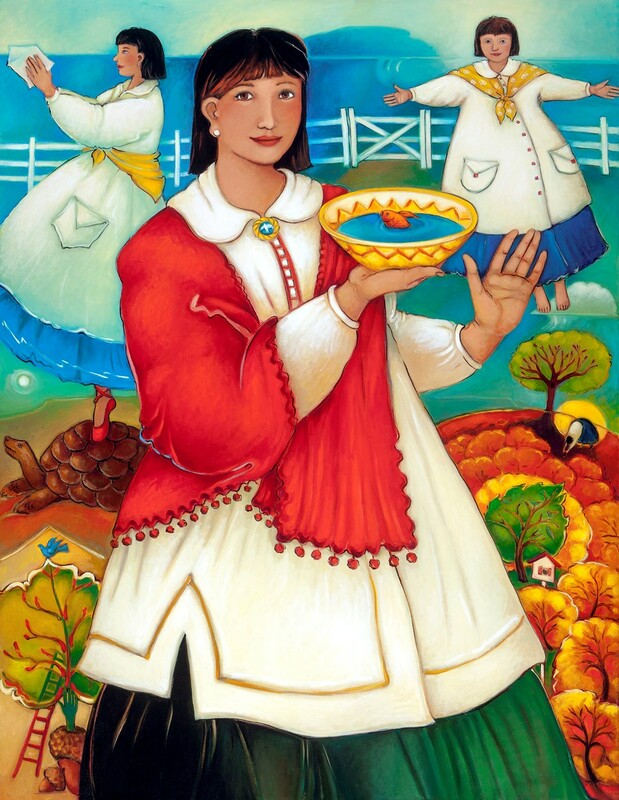 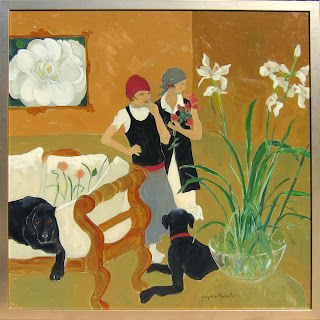 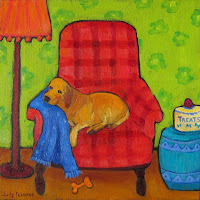 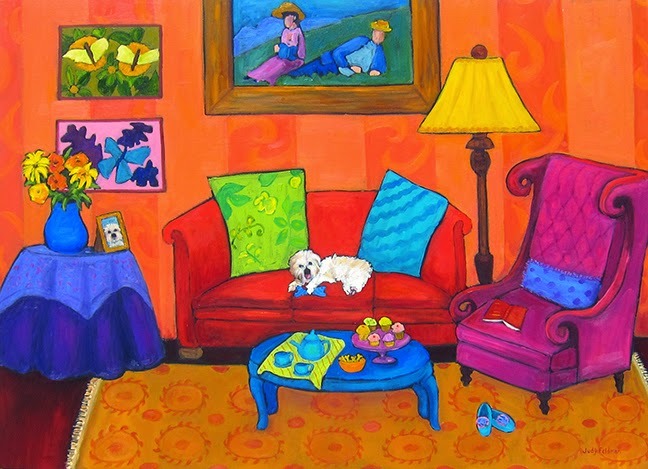 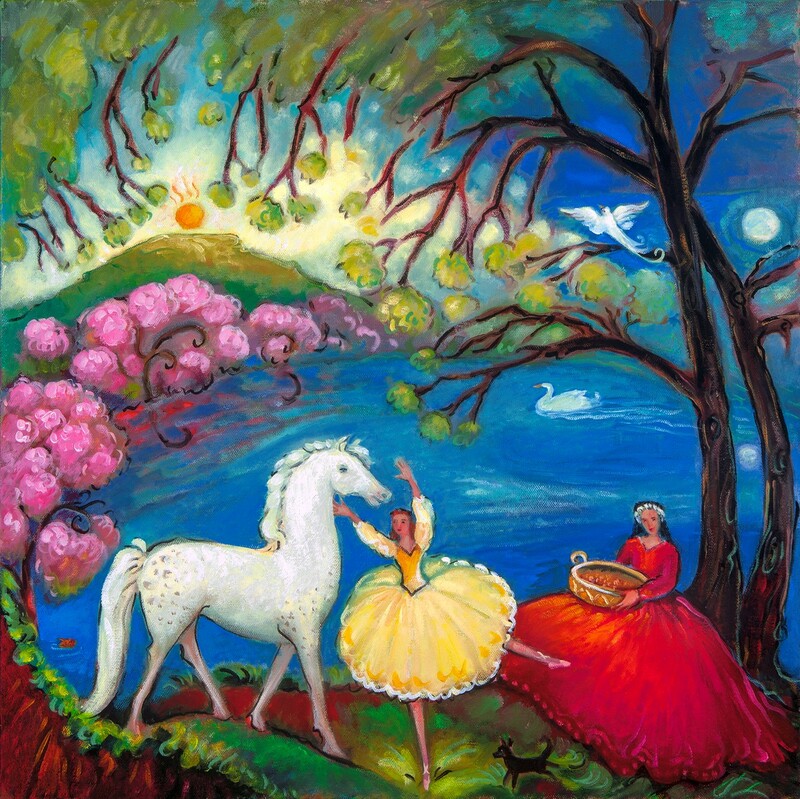 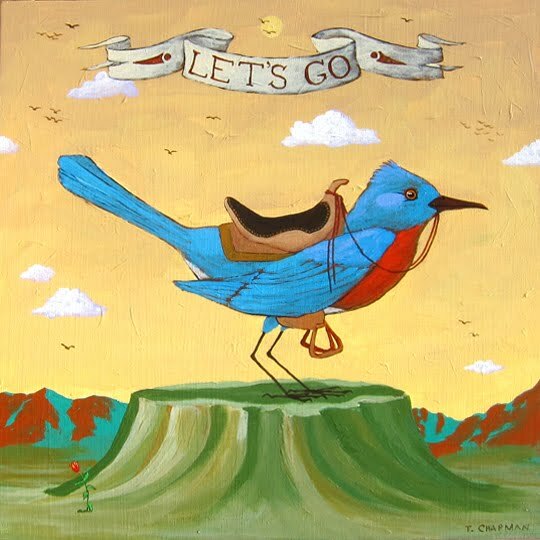 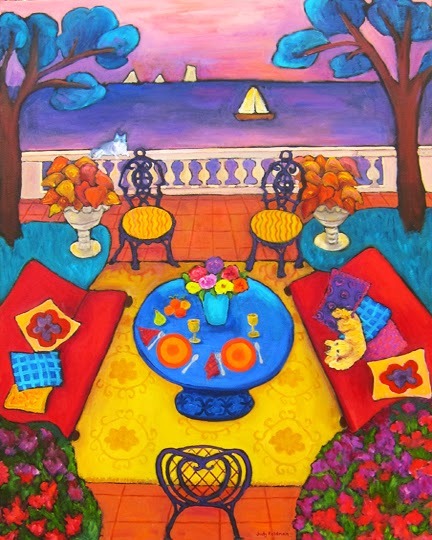 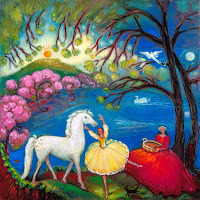 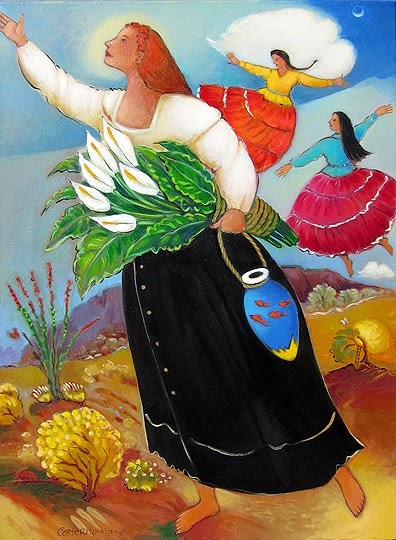 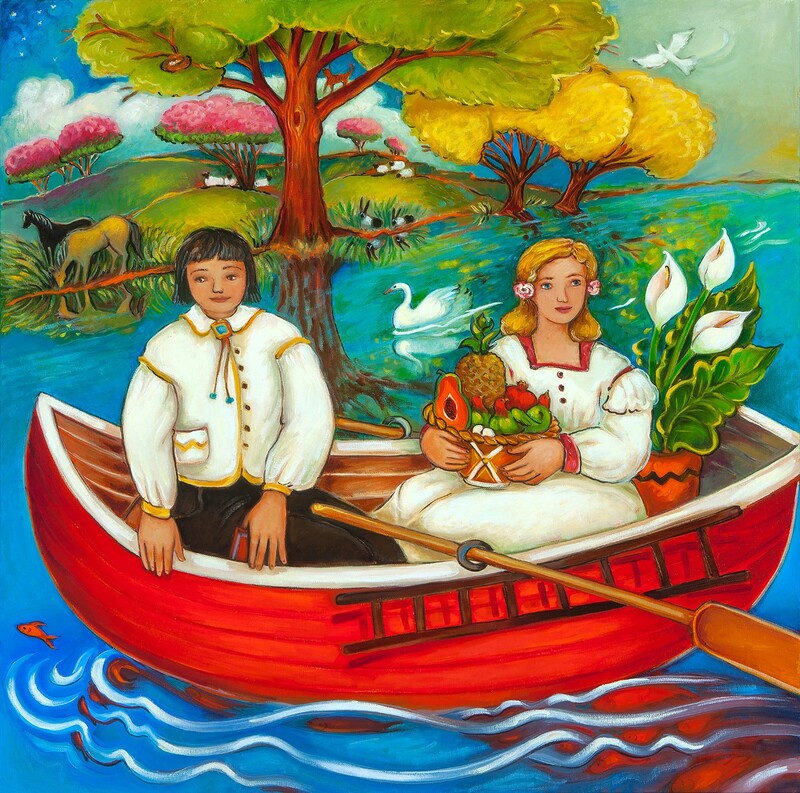 Linda has incorporated images that recur in her other paintings, such as the goldfish and the charming female figure, along with her typical color palette. 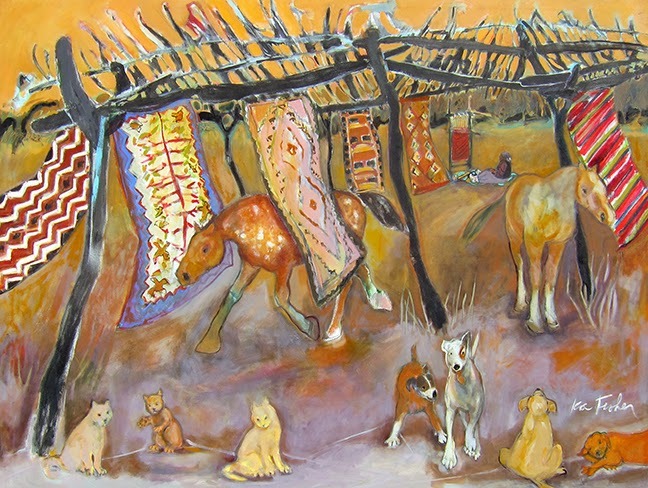 The show is not only about paintings. 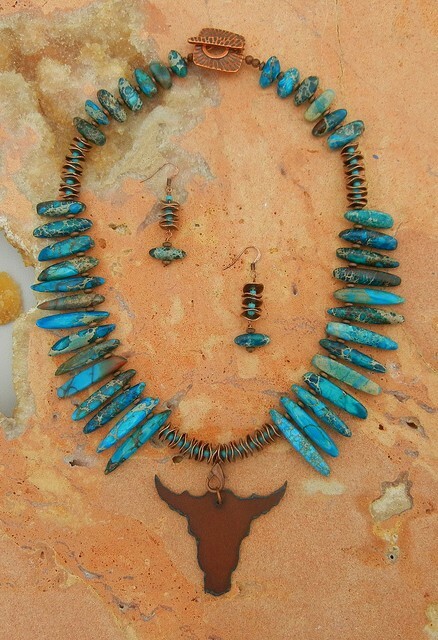 Adriana Walker has Necklace and earring sets (show Buffalo Past). 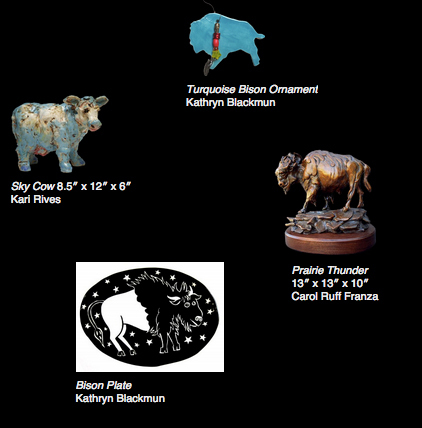 Kathryn Blackmun has created a turquoise bison ornament and a bison plate, and there are sculptures by Carol Ruff Franza (Prairie Thunder”), Kari Rives (“Sky Cow”) and “Yak Yak Yak” by Barbara Duzan. 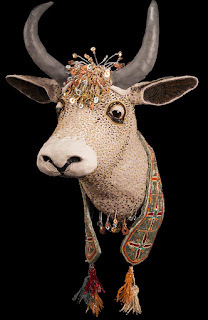 So, stop by during October and see this fun show. 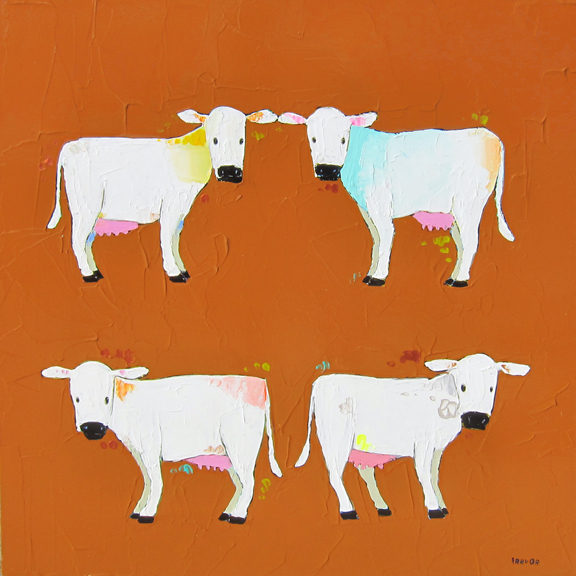 You never know, you might fall in love with a cow, a buffalo or even a yak! 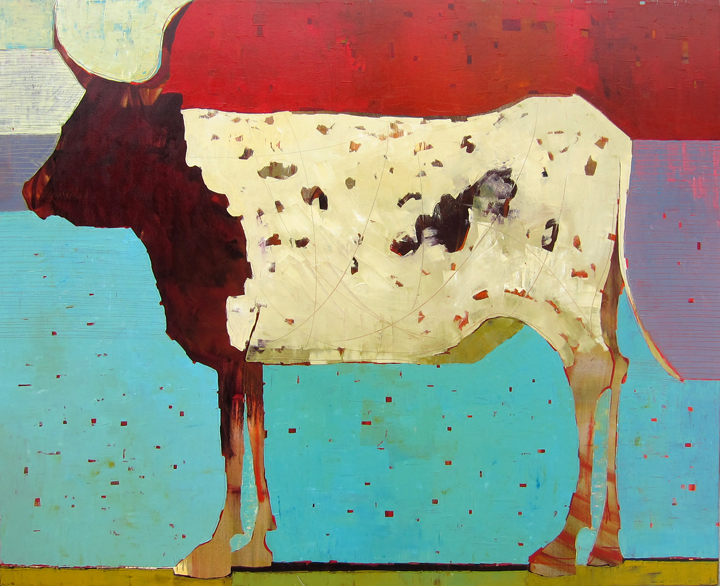 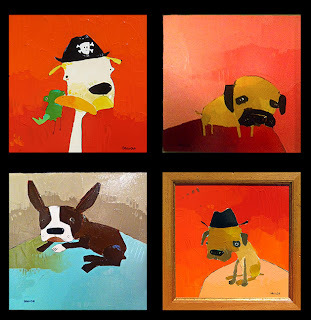 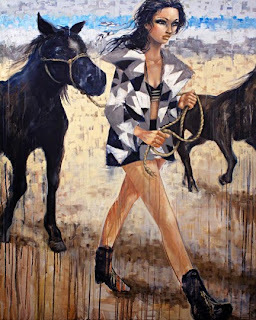 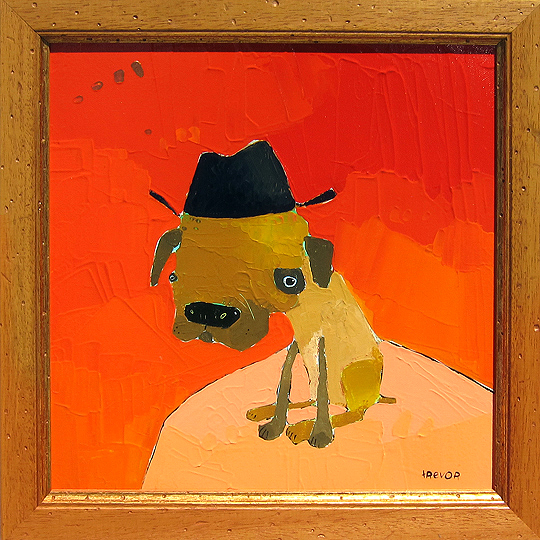 You can see more art from Divine Bovine at Wilde Meyer.